The Dutch artist Wapke Feenstra (1959, Hennaarderadeel), brought-up on a farm in Friesland, presents new readings on cultural manifestations in the countryside. By means of a direct dialogue with residents active in the landscape, she situates her artistic project in a rural setting. This project fits into a European framework and the ongoing debates about cultural heritage. Essential for Wapke Feenstra is the contact with the users and processors of the countryside. She organises meetings in which everyone can speak. In this way the perception of the environment is brought to life, creating new interpretations of the landscape. On invitation of FLACC, Wapke Feenstra’s project Moving Landscape, planned for 2010, refers to explorations in the Limburg countryside. This is done, by following the movements of land-related products: gravel, sheep, sand: everything that is produced by the primary sector that gets moved or travels. Wapke Feenstra will accompany the users of the landscape in various locations: a gravel extraction company on the Maas river, the Kempen moorland, a mine site in Genk, ... In each location one or two trips are made in which she travels with someone and thereby follows the land-based product. The artist photographs and reports what happens on a single day. In the autumn of 2010 the results will be communicated via newspapers, leaflets, GPS, and mobile phone, as well as via cycling and walking routes. In 2010, Wapke Feenstra explores the Limburg landscape by following the movements of land-related products. Luc Bessendorffer, Bichterweerd, Henri Boonen, Koen Caerels, Cathy Blervacq, Chris Coenegrachts, Jan Cuyvers, Roger Delaet, Willem J.M. Duijnstee, Michiel Dusar, Dirk Faes, P.A. van Gijsel, Christof Haesen, Heempark Genk, Xavier Huyghen, Myriam Jaspers-Vendrix, Luc Libot, Koen Martens, McCain, Joris Mentens, NMBS, Rudi Pieters, Pierre Prikken, Gerry Rentmeester, Johan en Carla Schouteden, Sibelco, Salvatore Spina, Hugo Struyven, Geert Thijs, Luc Vanoppen, Rene Vertommen, Mathieu Vranken en de fam. Wemmenhove. Every landscape is impressive when you get to know its geology. After a lot of scouring, shifting and a couple of natural disasters, Limburg is now a habitable piece of earth’s crust. 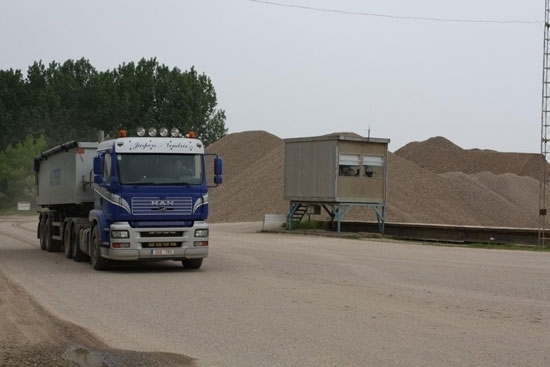 It is cultivated and the landscape produces quartz sand, potatoes, apples and gravel. The landscape continues to move and the product travels to the consumer. Cultivators look after the natural habitat using sheep or create a new one after soil extraction. Dutch artist Wapke Feenstra photographed the moving landscape in six Limburg locations for a year. The results of this journey are on show during PIT/Z-OUT. Simultaneously you can see the slide-shows in C-mine and on www.movinglandscape.be.